A few weeks ago, I checked out a short horror adventure game called “The Charnel House Trilogy.” It was a rainy afternoon, dreary outside, and I was really intrigued by the aesthetic and premise behind it. What followed was an incredible experience, and I immediately wanted to know more – about the studio behind the game, the influences, and the future of the series. So I (virtually) sat down with Ashton Raze, the brilliant mind and writer/director behind Charnel, who shared with me the planning that has gone into the Augur Peak series, some of the mysteries yet to be uncovered, and a tease of what’s yet to come for Alex and Dr. Lang. Tell me a little about Owl Cave. You have a number of people with different backgrounds in the industry under one proverbial roof – what brought you all together? Mostly Sepulchre, actually. I wasn’t involved with it originally, beyond writing it. Ben and Ivan came on board to do the art, so I got to know them via that. Then Lewis kinda took a back seat after Sepulchre due to work stuff, and I took over. The rest of the collaborators are just kinda… people I know really! I’ve worked in the industry for a while so I know people. DANGEROUS PEOPLE. Apart from Ivan, who is very safety-conscious. As a studio, you’ve produced a number of titles with different settings and ideas, all as adventure games. Why the focus on adventure-style games? Wellll, we’ve only done two really. Three if you count Masked, but that was actually just Lewis and he slapped Owl Cave on it retroactively. We all love adventure games! That’s pretty much the entire reason why. That’s not very exciting is it? Sorry. Sepulchre is the second part of the Charnel House Trilogy, but was actually released for free a few years ago. What compelled you to revisit that story? Did you write Sepulchre with the intention of one day revisiting it? I did! We actually said so in the end credits of Sepulchre, and almost nobody noticed. It wasn’t actually originally intended that we’d set more of the game on the train, but then stuff happened and I decided to write ‘a short epilogue scene’ which eventually became Exhale. But we always intended to revisit the universe, yeah. In fact my book is set in it, as are a couple of my Twine games, so it’s a persistent thing. 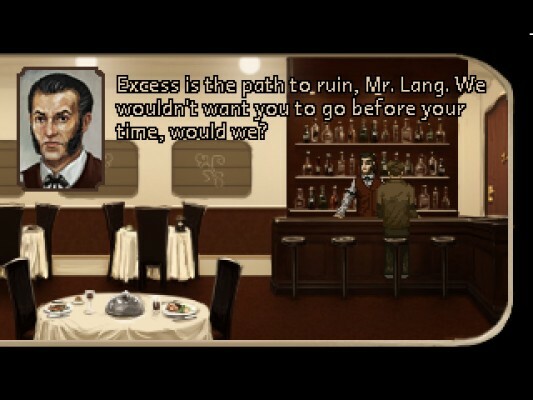 The new portions of Charnel, Inhale and Exhale, shift the POV from Dr. Lang to another character, Alex Davenport. Why did you shift protagonists for Inhale/Exhale? Do you think adding these stories frames Sepulchre differently than it did as a standalone title? Yeah, absolutely I think it frames Sepulchre differently. We didn’t use Lang as a protagonist because I don’t think there’s anything more to add to his role until the actual Augur Peak game. Once Kat’s properly introduced though, there’s a LOT more about Lang to find out. The intention was always to give a certain impression with Sepulchre, then tackle/contradict that suggestion in later games. I can’t entirely specify what that was, because a number of people are still theorizing along those lines now. I’ve already planned/scripted the opening scene of Augur Peak out though and lemme tell you, it blows a few things WIIIIIIDE open. To me, the Charnel House Trilogy is a horror adventure in the classic sense – during my time with it, I was reminded of titles like I Have No Mouth and I Must Scream, and other games that used to make my skin crawl. How did you go about crafting that looming sense of dread? Are there any games or other works that were big influences for Charnel House? Mainly I started thinking about what scares ME; trains, crows, and Jonathan Grier (Don the Train Guy). Then I worked from there. Nah, I’m… not entirely sure how to explain that actually! I guess my main premise was working on the fear of ‘the unknown.’ Just… okay, I’m having to tiptoe some really fine lines with this question because I could give far, far too much away. I have a really decisive answer but it’d RUIN THINGS. There’s a big, big aspect of the Augur Peak canon that people haven’t at all cottoned onto yet. Games and other works that were big influences for Charnel House is an interesting and relevant question there. People have pointed out a number of iconic horror references in the script. That’s… more than just referential. There’s a reason for (nearly) everything. Remember who’s really important throughout the Charnel House story, and what their role is. A couple of safe answers though; The Lost Crown and Scratches. Both fantastic horror adventure games. The voice acting cast of Charnel could be considered star-studded: names like Madeline Roux, Jim Sterling, Ashly Burch, Cara Ellison, and a slew of other names are all in the credits roll. What was it like coordinating and working with all these different personalities? Did their work have any effect on the way you wrote for their characters, or vice versa? The voice acting cast were almost all wonderful to work with, actually! Everyone delivered their lines on time, did retakes when needed, consulted on the dialogue if needed etc. Madeleine tweaked some of her lines to adjust a few of Alex’s Britishisms, although people may notice they’re not gone altogether, which is a clue to… something. I say ‘almost all’ though because Jonathan Grier is a massive diva who would only agree to do Inhale/Exhale if we agreed to make a metroidvania where you play as Don later down the line. And he wanted his own trailer. We don’t even have an office. Actually Johnny did a fair bit of amending for Don’s lines, making him more acceptably Scottish and tailoring the role to himself. And now Don’s a fan favorite. AND Johnny really is Scottish too. Take THAT, doubters. With adventure games they’re not hugely different actually! The puzzles, the bits you expect the player to fill in themselves etc, they’re the scenes, then you just craft them and try and picture how they’ll appear to the player; it’s not hugely different to describing a scene, you’re just doing it with a different layout and obviously very different end results. The fact you’re able to put trust in the player to create even more tension and ‘tell’ the story in their own way is one of the strengths of the medium actually. Not sure I’d say there are any drawbacks, just rather that it’s different, and suits different audiences. DO people say that about adventure games? I’m not really sure they do! Or if they do, then they’re incredibly ignorant of gaming history. I’ve personally never seen anyone say this about point and clicks, anyway. It’d be very silly. The majority of our audience is made up of what I guess people would describe as ‘core gamers’ so I think most people are pretty accepting of the fact that limited interaction doesn’t equal ‘not a game’ in these cases. So looking ahead – Exhale closes with a cliffhanger and an ominous spot for Augur Peak in 2016, implying a continuation of the story. Will we see Alex Davenport again in 2016? What can players look forward to in the sequel? Yup, you’ll definitely be seeing more of Alex. She’ll be playable again, along with Kat, Don, a new character whose introductory section opens the game, a mystery character I can’t drop any hints about, and POSSIBLY Lang, depending on how I decide to handle a certain part of the story. We’re aiming to make the game a LOT longer than our previous titles, 6+ hours hopefully, with an entire island of locations to explore, and maybe even some outside of Augur Peak too (okay, definitely at least a few outside of Augur Peak, confirmed). Also I’m paying attention to which characters people love the most, so I can channel my inner George R. R. Martin and kill them off horribly. Just kidding. Or am I? As for Owl Cave, do you have any other projects on the horizon besides Augur Peak? We do! I can’t really say anything about it yet, but we have another game coming out between now and Augur Peak time. Thank you for your time today, Ashton! Is there any plugs you’d like to make or places where fans of Owl Cave can keep up-to-date with your ongoing projects? Yeah, you should check out all the voice actors in the game and hire them if you’re a person who does such things! And you can keep up to date with us on our website www.owlcave.net although it needs a revamp and I’ve been terrible at posting on it, so following me on Twitter @ashtonraze is probably the most up-to-the-minute option. If you’d like to pick up Charnel House Trilogy, it is available through Steam for PC and I’d highly recommend you check it out. You can also follow Owl Cave through their website and Twitter.